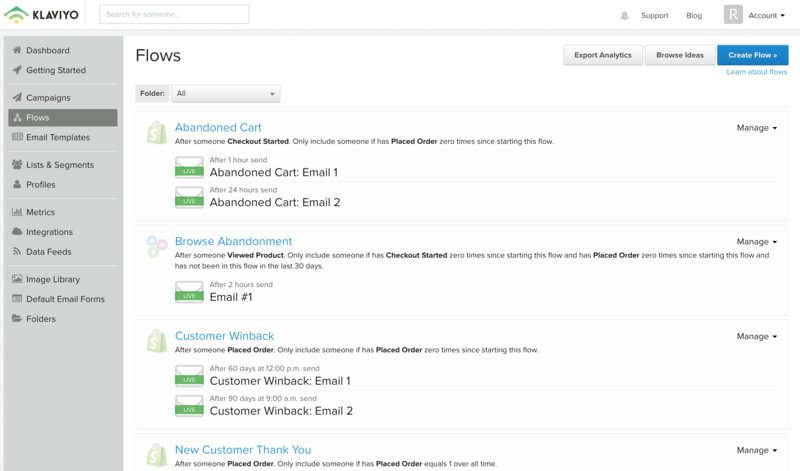 If you have an eCommerce site, I highly recommend you use Klaviyo as your email marketing tool because it is the only email marketing software created specifically for eCommerce businesses. And they’ve made creating a Klaviyo autoresponder email really easy. It’s free to start up until 100 subscribers. So it’s great if you’re just starting and don’t have the budget but still want to get a more sophisticated system in place for when you do grow and get more subscribers. They integrate with most major eCommerce platforms including my two favorites – Shopify and WooCommerce. 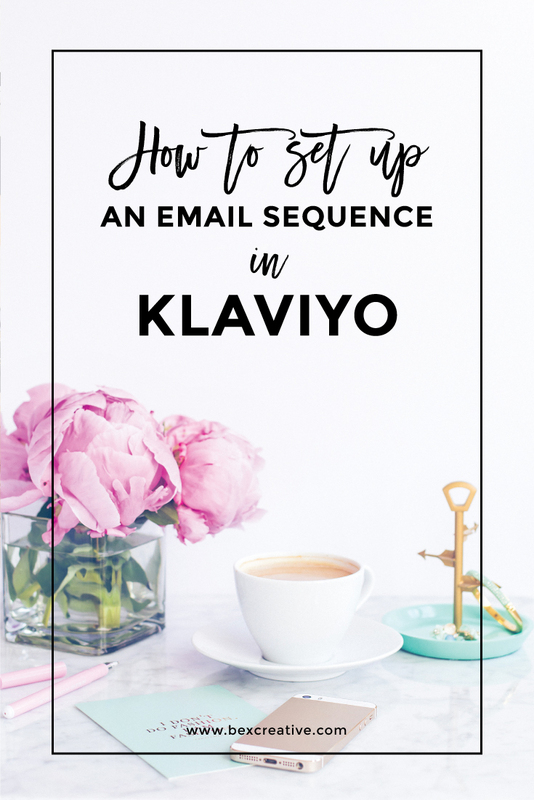 They already have a lot of automated emails (they call them flows) in place as soon as you sign up, so creating a Klaviyo autoresponder email series is really easy. This means you can have emails sent out automatically when you want to win back a customer that hasn’t bought from you in 30 days (or however many days you want to set) or send out a cross-sell email to suggest another product your customer might like to encourage repeat orders. They’ve pretty much thought of everything for your eCommerce email needs, and I can go into a lot more detail about all their great features, but today I want to show you how to set up a Klaviyo autoresponder email welcome series that gets sent out automatically when someone signs up for your email list but hasn’t purchased anything yet. 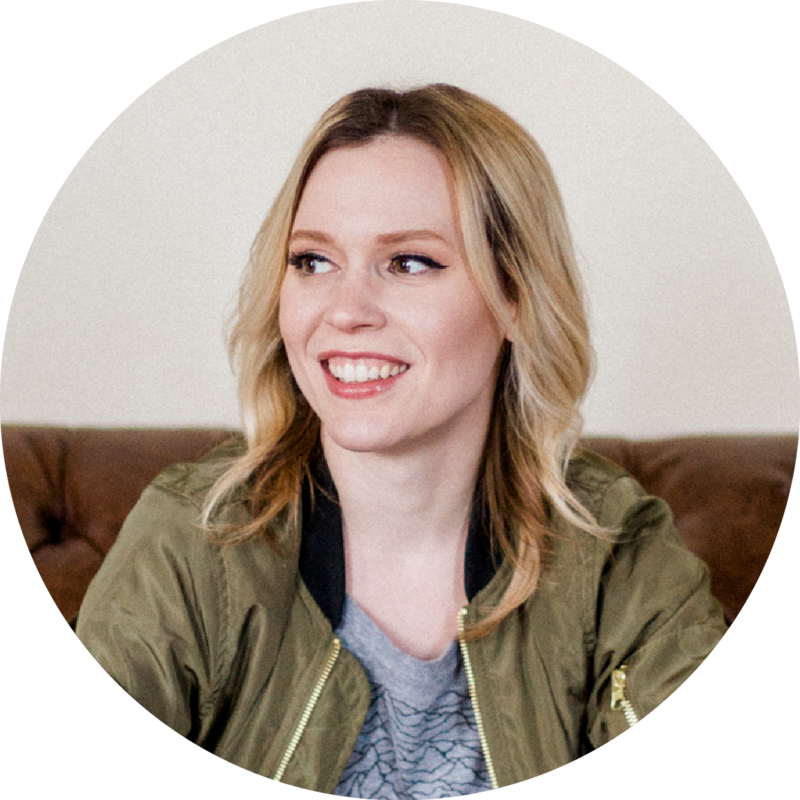 Having an email series like this in place gets your potential customers warmed up to your brand, and then they’re more likely to buy from you than someone who has just visited your website for the first time. In order to get visitors to join your email list and go through your welcome series, you need to make it obvious of where to sign up and incentivize them to sign up. Some common incentives include a coupon code, a free eBook, or an email course. In this how-to, we’re going to use a simple pop-up form with a 15% off coupon code. In Klaviyo, they have a default opt-in form already created. So we’ll want to edit it with our copy and brand colors. Go to Lists & Segments and they’ll have lists & segments already set up based on customer behaviors. 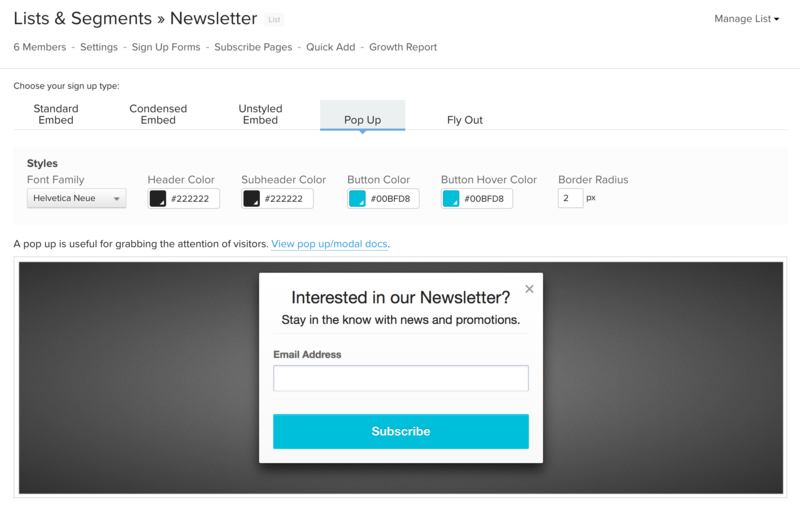 For this tutorial, we’ll focus on the default list called Newsletter. Click on Newsletter and at the top under Lists & Segments >> Newsletter, there will be a link called Sign Up Forms. Then you’ll want to click on the Pop-Up tab. This is where we’ll edit the default pop-up opt-in form. From here you can change the font and colors. Once you’re happy with those, we’re going to copy and paste the code. Then we can change the copy. Where you’ll paste your code will depend on what website platform you’re using. In this example, we’re using Shopify. 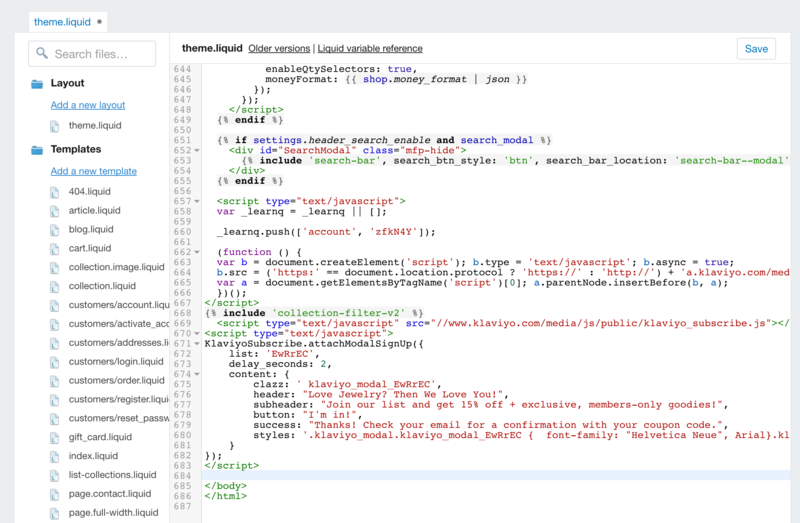 So you’ll want to go to Online Store -> Themes and then Edit HTML/CSS. Go to theme.liquid and paste your code all the way at the end before the closing body tag . Make sure to only change the words within the quotes, otherwise you risk messing up your website. If you’re comfortable with HTML/CSS and want to customize your pop-up form further, check out Klaviyo’s guide here. Click on Flows in the left-hand menu – Klaviyo already has a bunch of flows set up for you. If you scroll all the way down, there’s a flow called Welcome Series already set up. We’re going to take this flow and edit it. Click on Welcome Series and from there you can edit the default emails. As default, the trigger is set to When someone is added to the list Newsletter, which is exactly what we want. However, the flow filter is set to Placed order at least 1 time. I want to change this to zero times, because this is going to be my pre-purchase sequence for subscribers who haven’t bought anything yet. I will set up a separate post-purchase Klaviyo autoresponder email series for customers who have bought something. To edit this, click the pencil icon and set the parameters to Someone who has Placed an order Zero times over all time. The first email is set to be sent out immediately. This is perfect. We want the subscriber to get the first email as soon as they sign up. The other emails are set to 3 days after the previous email. This is fine, so we’ll leave it as is for now. But you can change these to whatever days or hours you’d like. Click on the first email and it will take you to a screen where you can edit the from name and from/reply-to email as well as the email subject. Change those to whatever you like and hit save changes. Then click the edit content button to edit the body of the email. From here, you can add your logo and images and change the text. 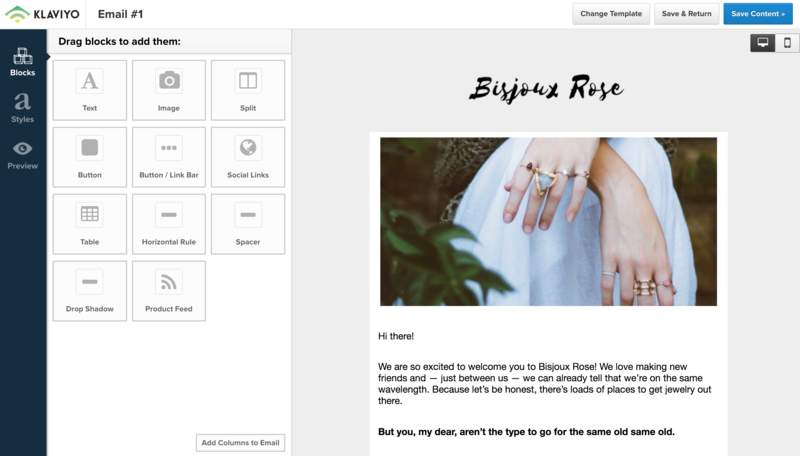 It’s very similar to MailChimp with it’s drag and drop builder. Once you’re done writing your first email, hit Save & Return and you’ll go back to the Welcome Series flow. Repeat this process for the 2nd and 3rd emails. 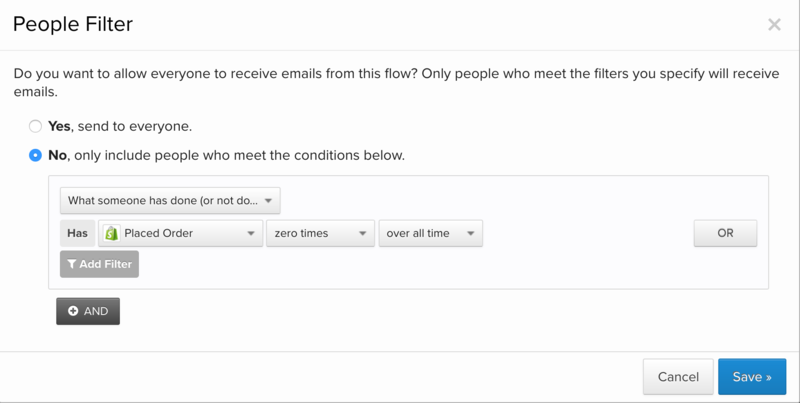 If you want to add more emails to your sequence, click the Add email to the flow button all the way at the bottom of the page. Once last thing – to make sure the emails get sent out automatically, you’ll need to make sure they’re set to live. As default, they’re set to the yellow Manual square. Hover over the square and three options will pop-up. You’ll want to click the green Live square. Make sure this is set for all of the emails in your sequence. 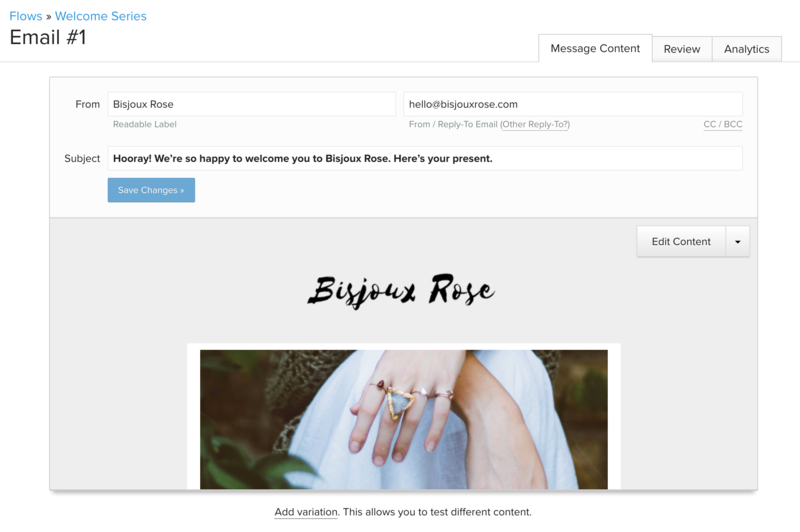 This will ensure you emails get sent out automatically once someone joins your list. So, creating a Klaviyo autoresponder email series – done. Now just sit back and let your subscribers automatically go through your flow, making you more sales. Do you have any tips for a successful welcome email series? Please leave a comment. I’d love to hear them!